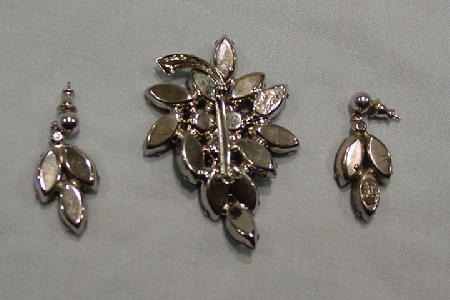 This vintage brooch/pin and pierced earrings set are by Park Lane. 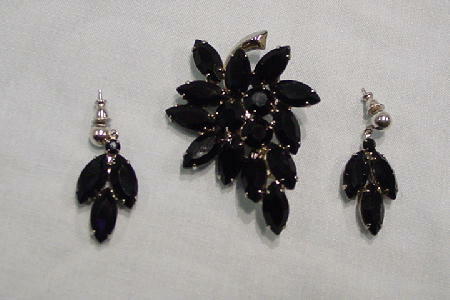 The black faux gems are held in place by silver-tone bases and tips. At the top of the brooch is a silver-tone stem. The back has a safety clasp closure and Park Lane is stamped (etched) in the back. The name is also on the back of one of the earrings. The earrings have silver-tone balls at their tips. She wore them in a photo shoot and liked the set so much she bought it.